I go back and forth between my natural kicks -- wanting to make everything from scratch vs. buying products. The happy medium really is to find products that are so natural that they are just as healthful as making them yourself. But, when you really win is when you find a product that is healthier than if you made it yourself. 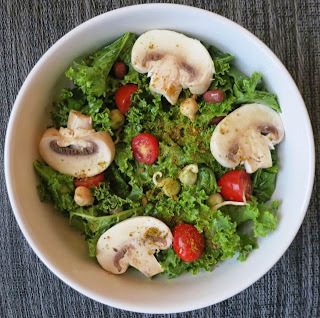 That is the case with RawFoodz salad dressings. RawFoodz is a company started by Michelle Cass and Sher Kopman who wanted to produce nutrient-rich, sustainable, raw, vegan foods. 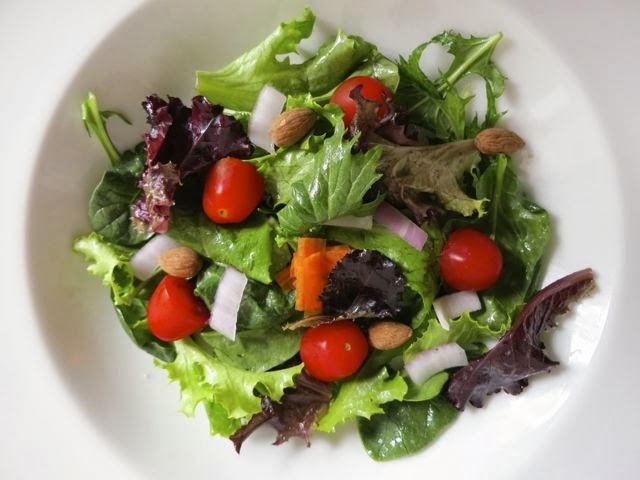 They use a blend of organic whole foods and superfoods that carry immune-boosting properties to create their salad dressings. They sent me three of the dressings to try out and I thought all three of them were great. My favorite one was the Sea-Zar Serenity. 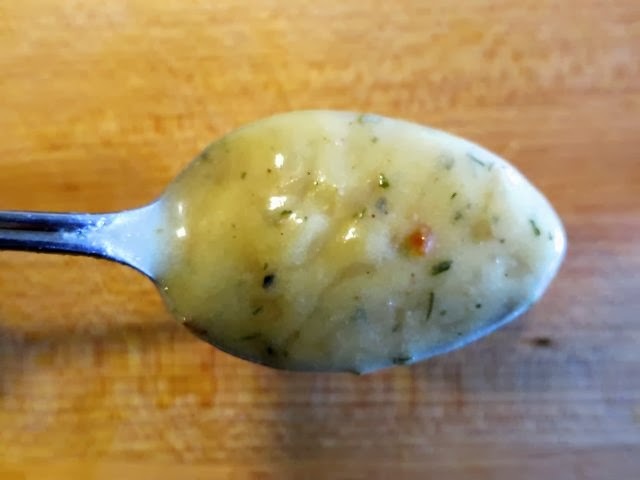 Not being a big Caesar salad fan, I decided to just use this dressing on a salad that I made while not conforming to the typical Caesar salad. 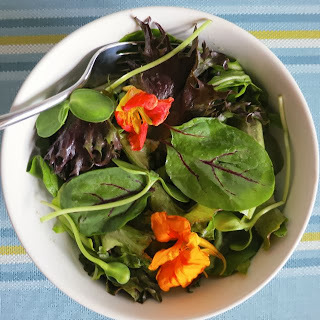 So I took a mesclun mix with edible flowers and added sorrel and sunflower shoots. That's when I found that Sea-Zar is not just for Caesar salads. You get the rich Caesar flavor, but without the nasty creaminess that makes the dairy-based salad dressings taste the way they do. It is creamy enough to coat the greens really well. And best of all the ingredients are entirely good-for-you -- extra virgin olive oil, apple cider viengar, coconut sugar, dulse, unhulled sesame seeds, hemp seeds, garlic powder, chia seeds, nutritional yeast, onion powder, sea salt, and black pepper. No added preservatives and nothing artificial! Next, I tried the Glorious Greek, and glorious it was! I used this dressing on a mix of kale, sprouted beans, tomatoes, and mushrooms. It is light, yet incredibly rich and satisfying. I loved the flavor of this one. I also tried the Italian Idol on my spring mix with grape tomatoes, red onions, carrots, and almonds. It's funny, when I first took the dressings out of the refrigerator, they had solidified. When I asked Michelle if this was normal, she reminded me that real olive oil without preservatives solidifies when cold and that I just needed to let it sit out for three minutes so it would thaw out. She said if it doesn't solidify, then you should worry. So true! Other flavors include Japanese Joy, Purely Poppy, Ranch Revival, and French Fusion. I want to try them all! So if their objective is truly to "infuse health with superior taste," then I would say they met their objective. 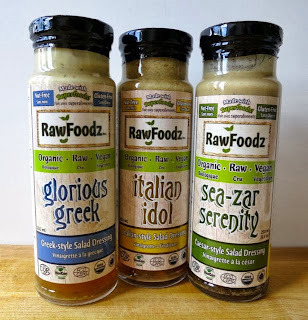 RawFoodz is a Canadian company who is just making its way into the US. Look for their products in Whole Foods in California, Arizona, and Nevada. Distribution is growing quickly as they now have some availability in Dallas, Washington, Florida, Chicago, New York, and Denver. The dressings retail for $6.99 - $7.99 each. Organic, raw, and vegan with no preservatives = a recipe for success.